Many Canadians have faced this predicament: “should I stop for Tim Hortons on my way home from work?” Sometimes, the quick warm-up is all you need to start the rest of your day. Many Canadians have faced this predicament: "should I stop for Tim Hortons on my way home from work?" Sometimes, the quick warm-up is all you need to start the rest of your day. 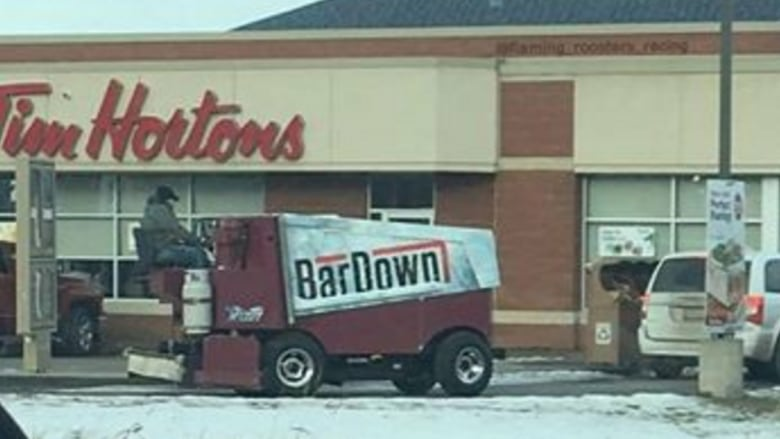 But when most people consider the detour to Tim Hortons, they aren't driving a Zamboni. Jesse Myshak was at work in his shop in Stony Plain on Tuesday with his new ice-surfacing machine, which he bought to flood his rink in his backyard. He was working on it in the shop, and it was ready to be put to work at home. There was only one problem — home was a couple kilometres away. Luckily, there was a solution. "I figured I'd just drive it home," Myshak told CBC News. After deciding to make the trek, the ball started rolling. "Guys at work were kind of laughing after I was driving home, [they said] to drive through Timmies and get a coffee," Myshak said. The most Canadian thing ever? Myshak, on top of the uncovered Zamboni, moved at the speed of a crawl down the streets of Stony Plain, much to the delight of passersby. But the level of Canadiana increased tenfold when he crept his way into the Tim Hortons drive-thru. "People started running out of the Tim Hortons," he said, adding they were taking photos and videos of his unusual method of transportation. He ordered a hot chocolate, and when he inched his way to the window, the Canadiana level went off the charts. "The lady in front of me actually bought the hot chocolate for me," Myshak said. "The staff told me it was the most Canadian thing they've ever seen, so they all had a good chuckle." And, the cherry on top — the Zamboni was perfect height to receive his hot chocolate out the window. Myshak said when he finally made it home, he told his three kids. They were already quite excited about the ice-surfacing machine. "They're more excited about the Zamboni than the rink, to be honest," he said, adding his youngest already wants to ride on it. But when they found out about Myshak's adventure, they were amused. "They laughed that dad drove that through town," he said. "I'm sure they told their friends at school — I'm almost positive on that." Since then, his phone hasn't stopped ringing — with most people recognizing him on the Zamboni immediately. But he said while the attention has been fun, the ice machine isn't likely to make another appearance on the road. Myshak has no complaints about the level of traction out on the roads. "She's got studded tires, so, it just cruised along quite well, actually," he said, but he's unlikely to drive it out again. "She goes pretty slow, and it's quite cold." Plus, he's not quite sure how the police would react. "It's attracted quite a bit of attention [but] I don't know if the cops around town like it or not," he said. "I got lucky, I think — I made it home all right." But Myshak is hoping the new-found attention will draw the eye of the love of Edmonton's life, Oilers captain Connor McDavid. He's hoping to recruit the hockey superstar to drop the puck for his son's hockey team at the rink. He might have to let McDavid rip around on the Zamboni, and he's OK with that. "He can take it, if that's what it takes, he can have it," he said. Perhaps the only thing that would make this tale more Canadian is to have McDavid rolling through the drive-thru on the Zamboni.